Sometimes, there are moments of serendipity. One of the stops on our little Boston jaunt was the art museum at my alma mater, which had a small installation by Kiki Smith, "Artist as Curator". It was the kind of installation that really appeals to me - a mash-up if you will - in this case, many many vessels arrayed in cubbyholes. The vessels were varied in size, material, age, color, purpose - but all of the objects could be construed as a vessel, a container of some sort. The object in the array that I came back to several times is no longer a vessel - instead it's a now fused stack of broken Chinese porcelain, found at a shipwreck*. It's crusted with barnacles, and it's taken on a whole other aspect, somehow organic, with insect-like articulation along the stacked bowls. Nature has created art from a man-made thing. Later during the weekend, we saw a documentary, something that I've been meaning to watch for about two years. I'd thrown the DVD in my bag thinking if there were downtime in the hotel, it might be perfect. And it was. Rivers and Tides is about Andy Goldsworthy, a British sculptor who works with natural materials. Sometimes he builds things, permanent things, like the serpentine rock wall at Storm King or the many ovoid cairns he's done in different places. But lots of his work is ephemeral - it lives for moments, or a day, recorded in memory or through photography. He'll pin leaves together with pine needles, sewing a long ribbon, which he then sets loose on a river. He'll build driftwood arches where the tide will wash them away. He breaks and re-forms icicles to create loops round a tree - until they melt. It's breathtakingly creative and a little bit crazy. And it's kind of the opposite of the Chinese porcelain sculpture - it's man turning nature into art. Somehow, the juxtaposition of experiencing that Chinese porcelain in the museum and the ephemeral natural art in the documentary sparked all kinds of creative juices in me. It's related to my impulse to knit hats out of scrap yarn, or make blankets out of old t-shirts. It's the revisiting of a material and giving it new form, new life. *Sotheby's auctioned off many of the salvaged pieces; their press release on the shipwreck and the sale is here (it's a pdf). The piece about the artist was fascinating. I feel that way about my writing. i think my writing is my art. in my heart I believe that. Ok I gotta get some more culture in my life. seriously. not a "little" crazy - that guy is so batty it makes my head ache. Ahh, the question of art. Where is that line between clever and stupid? I just love that guy! I want to be him for a day. 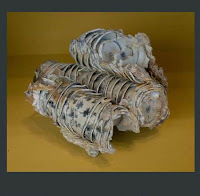 When I first looked at those bowls I thought they were some kind of insect creation, like a really wild paper wasp's nest- but of course it is obvious when I look closer and read what you were saying. That sounds like a really cool exhibit. My mom practically had to twist my arm to watch the Andrew Goldsworthy film and afterwords I was kicking myself for such resistance when it turned out to be every bit as mesmerizing and gorgeous as she promised. Andy Goldsworthy's work is so interesting. I love how his patterns make use of or often echo natural patterns.